Home » Beyond Easy » Heard of Two Buck Chuck? Here’s a Two Dollar Stew! Okay, mine doesn’t rhyme and you don’t drink it, but it’s still a budget saver! 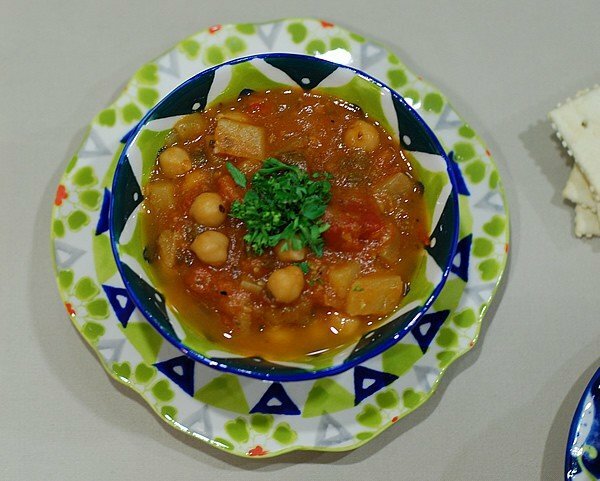 My Key Ingredient vegan column today is all about making this cheap, filling and delectable veggie stew. There are some naysayers who think that you can’t eat healthy on a budget and that’s jut not true. Yesterday while I was in my local Kroger checking the bargain produce bin for some old bananas, I found a bunch of red mesh bags. Inside these bags were assorted goodies bundled together. There were a few odd combos, but I snagged the perfect bag for stew. It had 2 turnips, 1 organic yellow bell pepper, a green bell pepper, a very small yellow squash and a zucchini. 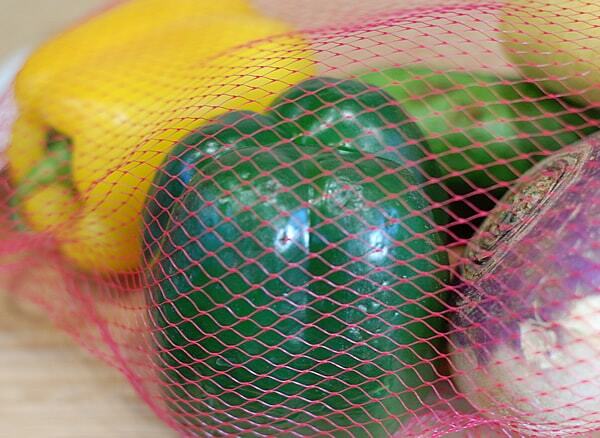 99 cents for the whole bag – that’s about 17 cents per vegetable! So what’s up with the bargain bin? There are many reasons that can get a veggie or fruit banished there. Bananas get spotty as they age and some people think they look rotten next to the greenish-yellow ones. However, they really are ready to eat and cook without waiting. I will say that I’ve gotten spotty bargain bananas that I had to let sit for days to get ripe , but they were still cheaper. If you see a big bag of bananas and you won’t use them all in time just peel them and pop in a freezer bag for smoothies or to bake with later on. Some veggies in the bags are blemished, and my summer squash was, but I just peeled them and took off any spots before cooking. These needed to be used within a day of buying. The green bell was looking a little wilted, but I’ve used plenty of forgotten peppers from my fridge that looked worse. The yellow bell had one tiny black spot that just needed to be cut out and actually would have lasted the week in my fridge. The turnips were a little beat up, but you peel turnips anyhow so there’s no harm done. There will be some veggies in the bin that are way past their prime so look closely. Some packs only have one piece that’s not usable so they are still worth getting. The more often you look the more likely you’ll find organics and specialty items at a price you can afford. Using that and some leftovers in the fridge – as well as from my pantry – I created a stew that’s like a thick vegetable soup. In fact, if you want to feed more people you can add more water or broth to make it a stew – just make sure to increase the spices and salt. But how could this be under 2 bucks? 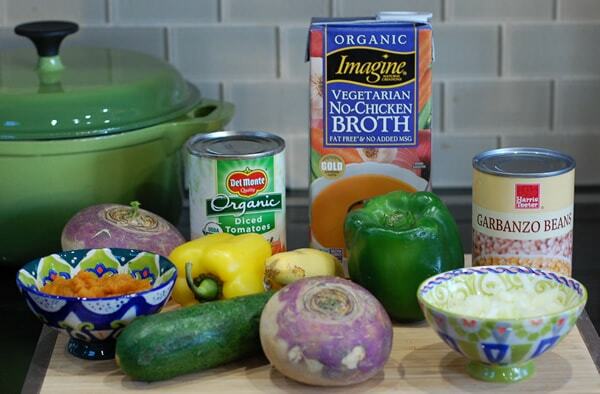 I also scored my veggie broth for 79 cents, the can of organic pumpkin for 49 cents and the beans were 45 cents. All have dates that are good and they don’t expire for at least a year so I stocked up. Veggies: .70 (I have a leftover turnip and 1/2 of each bell pepper. I am not counting my spices or really even the 1/2 onion and pumpkin that already needed to be used in the fridge. Give or take a few pennies that about $2 bucks for the whole meal. 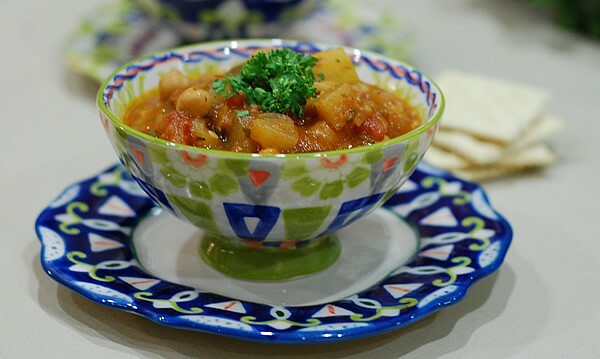 Now go to Key Ingredient to get my recipe for this Budget-Friendly Veggie Stew!